A ready-to-gig amp with true tube tone. The amp is seen throughout this video. Where it is plugged in to Jack White`s guitar. It is seen several times through the whole video. In this photo taken from their "Intimate Irving Plaza Show", Dave can clearly be seen standing behind a Fender Hot Rod. A Fender Hot Rod Deluxe III amp is used by Alex Kapranos at the 2004 Pinkpop Festival. Live, Chromeo run their guitars through the Fender Deluxe Amp, with "nice and warm 6L6 tubes inside." Dan play this amp on lots of live performances. 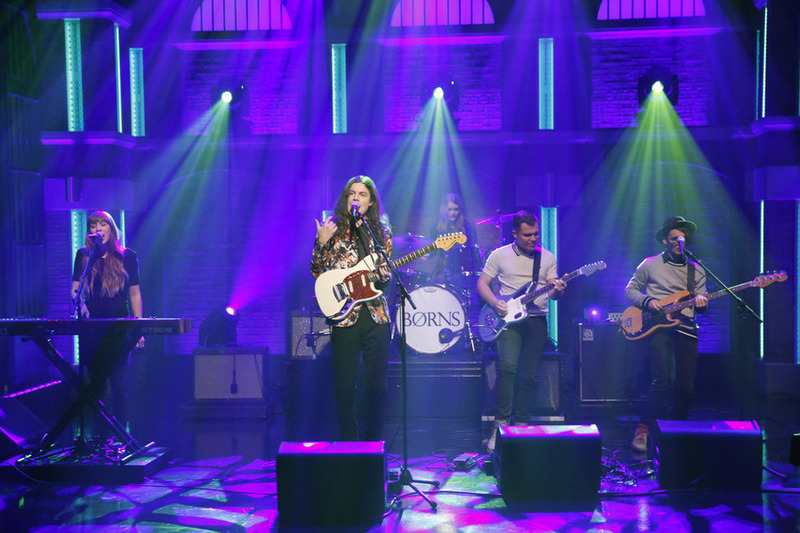 In this image of Vampire Weekend on Saturday Night Live, a Fender Hot Rod Deluxe can be seen clearly in the backline. In this pic of the stage, you can see two Fender Hot Rod Deluxe on the the left side. Juanma used this amplifier in a radio/internet show called ''Masterclass 6x3'' by Sergio Bustamante in Radio 3, the spanish public music radio. At 0:08, Steven names the amplifiers behind him, which includes a Hot Rod Deluxe. He states the Deluxe is for home use, not on tour. Mike Rutherford states in [this interview](http://www.premierguitar.com/articles/22307-mike-rutherford-back-in-the-shop-with-the-mechanics?page=2) with PremierGuitar, "The key thing in my rig is an old Fender [Hot Rod] DeVille 4x10. I’m running the guitar and pedals into it. I sometimes run them in stereo, with one amp being the straight sound and the other having delay only." This amp can be seen on the left of this pic. It's an earlier pic, today he is using different amps. In this photo, Flynn's Fender Hot Rod Deluxe amplifier can be seen behind him. In this post we can see two amps, a Fender Hot Rod Deluxe and a Fender Excelsior. According to the Premier Guitar's interview, Bush uses the Fender Hot Rod Deluxe. In this live performance you can see Alana playing through a Fender Hot Rod Deluxe III. You can tell by the size, as it stands next to two Fender Hot Rod Deville 212, played by her sister Danielle. In this pic, you can see King Krule sits on a Fender Deluxe. In a facebook post Ritzy says she uses a Fender Hot Rod Deluxe. In the video you can see the hot rod deluxe behind Will. Jordan is seen often using a Fender Hot Rod Deluxe with a Supreme sticker over the Fender logo. In this video, it appears Stevens has replaced his Fender Bassman with a Fender Hot Rod Deluxe (II?). "Got my first guitar today!! It's a beautiful @fenderguitar standard Tele....never too late to learn. So excited...Love my Fender family so much! #FenderTelecaster #whiteonwhite #FenderHotRodDeluxeIII"
zZounds: What amps do you use live? Connor Doyle: When we have our own backline I use a Fender Hot Rod Deluxe 1×12? and when there is a rented backline I usually use a [Twin Reverb](http://equipboard.com/items/fender-twin-reverb). Original source [here](http://blog.zzounds.com/2015/05/06/borns-guitar-rig/). In this photo of the frights playing live, a Fender Hot Rod Deluxe can be seen behind Mikey's legs. In this Audiotree performance, she is plugged into what appears to be two Hot Rod Deluxe amps. 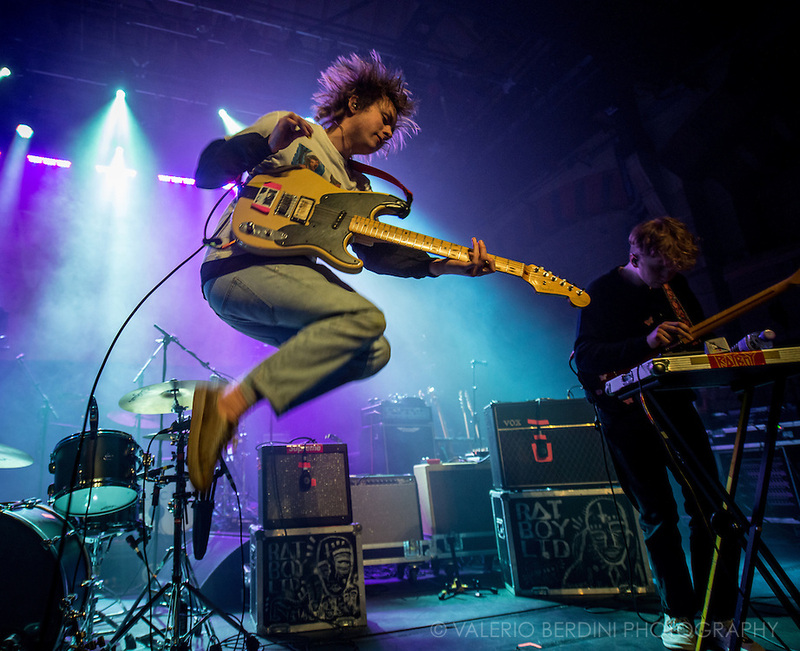 At the top left corner of the photo, Josh Dewhurst can bee seen playing through two Fender Hot Rod Deluxe. "Great session today at the BBC's lovely Maida Vale studios!" At around 2:48 in this clip you can see the Fender Hot Rod Amp in the bottom right of the screen. "And then, halfway through making the record, I bought a Fender Hot Rod Deluxe. That’s always a fun amp I go back to because it’s so simple and it has a lot of bass." You can see it behind His sister/synth player. given tht he is the only guitar player in his band so it must belong to him. If you scroll towards the end of the article, you'll see most of the equipment she uses. Amp can change based on venue, but regularly uses the Hot Rod. The ever-popular 40W Fender Hot Rod Deluxe III, equipped with a 12" Celestion speaker, may be the world standard for gigging guitarists. With bottom-end headroom characteristic of 6L6 tubes and a versatile all-12AX7 tube preamp, the Hot Rod Deluxe III amp offers luscious Fender spring reverb, an effects loop and more. If you want to add a little output, fullness, and stage coverage, you can even add a matching 1x12 extension enclosure to your Hot Rod Deluxe III. The Fender Hot Rod Deluxe III amp also packs these upgrades over previous models: easy-view black control panel with front-reading text, new badge, streamlined footswitch, graduated volume and treble pot tapers, tighter overdrive and a Celestion G12P-80 speaker. I love this amp, and it works flawlessly with my board, giving me the cleans I need to really let my pedals do the talking. 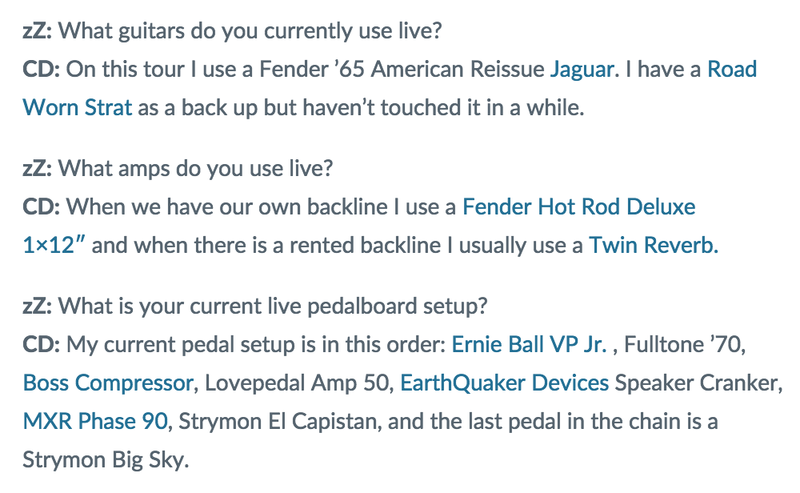 The overdrive channel is mediocre, but who buys a fender for the overdrive anyway? It's that beautiful clean that makes this amp a phenomenal choice. Put 12at7 tube in it you will never look back! This baby pushes so loud. never need it at more then 4 for live gigging.. and that's if you're in a bigger venue. The Jensen speaker is perfect. The clean channel is all you need. I bought this amp because it has pretty good headroom in the clean channel, and it takes pedals really well. I essentially wanted an amp that is a clean sonic palette for my pedals and this amp does the job really well. It sounds super full and warm. This amp can get pretty loud though, so watch your volume when playing in smaller venues. I recently acquired the FSR western noir version (Black faux-tooled leather vinyl covering, wheat grille cloth, Celestion G12H Greenback speaker). The amp was everything you'd expect from a classic Hot Rod Deluxe. Takes pedals well, lots of out of the box clean Fender tone to work with. As others say, the distortion is wimpy, but low gain settings might be useful. I would recommend this for most churches, and venues where where guitarists will be mic'ing their amps. A Sennheiser e609/906 against the grill is a great, easy combo for this. I have already swapped the tubes on this little amp with a combo that I will swear by for a long time to come. 3 Tung-Sol 12AX7 preamp tubes and 2 TAD 6L6WGC-STR power tubes yield a pretty phenomenal tone from this amp. Compared side by side with another Hot Rod Deluxe III, the swapped tubes (with the G12H speaker) came very close to a much beloved tone I found in a vintage silver face Twin Reverb. This isn't to say it's the same; it's not. However, with the bright switch engaged, it is in the direction of the scooped mid and spongy hi's and lows that the SFTR produced so well. This is now one of my most favorite amps due to the combination of it's tone, portability and price. I was looking for an amp with plenty of break up, also something that can go from rhythmic cleans to screaming leads on a moments notice. This is that amp. It's clean, vibrant, and brings your guitar to any place it needs to go. Looking to "cut through the mix"? Throw on a high gain overdrive or a Big Muff and tear down the venue. Mostly I play blues and rock and I like the ability to deliver a clear, warm sound; everything else that I need comes from my pedalboard because I am not very fond of the distort channels, especially the More Drive for its loudness. I think that generally the only thing that I find difficult to master is the volume, too loud too soon. Great clean tone. Makes any pedal retain it's true sound. Heavey, loud, three channel tube amp. Mine is customized with a Celestion speaker, making the sound a bit directional. A reminder to anyone who uses this amp, that the right side input is less loud than the left side. Make my pedals and guitar tone to clouds ! I use this occasionally for recording when I need that fender clean tone we all know and love. The dirty channel doesn't sound great (I prefer using pedals to achieve my distortion) and the clean channel is insanely loud at anything above 3 on the volume knob. Sounds good though - just don't accidentally knock that volume knob! "try putting a 12AY7 tube in V1 to get more useable headroom and a more 50s response" This sounds like the kind of advice I've been looking for. I will try this out - thank you! it'll probably make the amp a little less boomy too, you may or may not lke it, but the bassman preamp was designed around the 12ay7, marshall stuck ax7es in it in his JTM45 but if you want a pedal platform the old school ay7 might be your thing. Or you could just trade her in for a deluxe reverb and be happy as a clam. I'll give the 12ay7 a try. I watched a few videos of it in action and it looks like just what I'm looking for. The Hot Rod has a great American sound to it. It chimes and has crisp cleans. The distortion channel leaves something to be desired, but I use separate pedals anyway for overdrive and grit. Super versatile, Badass fender tone. I use it since 2012 and i still love it. I really like how it takes my pedal and how it sounds as a clean amp. Hot Rod Deluxe iii. 40w tube amp. Clean and dirty channel with reverb. As mentioned in my review of my current amp - Marshall 1974X - I parted with the HRD after years of pushing it with pedals but never taking advantage of its great clean tone. Club staple, lasts forever, takes pedals well. Authentic tube tone, great for pedal collectors. Some complaints about the gain channel but throwing an EQ in the effects loop makes it a real beast. The GOLD standard for tube amps everywhere on earth. seriously? you think the lowly hotrod is the 'gold standard' ? they're workhorses, but GOLD STANDARD? Cheap, reliable, versatile and LOUD AF and has been so for a long time. Its pretty much one of the most used amps ever and it's a gigging musician's best friend. It responds to pedals well and can sound brutal especially with good pedals, or clean and pretty with a sweet built-in real spring reverb. Dude this thing is like the swiss army knife of amps. Perhaps not the greatest, GOLDEST sounding or most badass of all time, but I would definitely call it the industry standard. Bro it sounds good with a trombone going through it! But trust me, I'd rather be going through a Mesa Dual Rectifier, PRS Archon or OMEGA Obsidian! It's the most popular for a reason. Tons of power, great pedal platform. Awesome amp. I had one, but had to sell it. The Hot Rod Deluxe III, (improved model with new Celestion speaker), is the best for using pedals for. it has FX loop as well as its own distortion which is great for arranging how you want your pedals layout. An amazing amp. This thing just gives the guitars I have that amp they needed to sound amazing. Best clean tones I have heard other than a '65 Twin Reverb. A Very good amp! On both, clean and drive channels. Really love the drive channel (on 4/5 without extra boost). While waiting for another amp to come in, I picked this one up. I played at GC several times before I went for it. I love the clean channel. In the store, I liked the dirty channel too, but at home, not so much. The dirty channel cuts the bass, resulting in a mid-tone sound that is OK, but not what I prefer. I'm still keeping this for now because it is small and covers most of the ground I need it for. One use is to run my Line 6 HD500 into the FX loop and rely mostly on it's power section. Works pretty well. (Stop cringing.) But mainly, I find that this amp, a compressor and a Telecaster are all I need for just about anything. Done and Done. It's all about the tone, man. I'm convinced this is the only amp I would ever need. With the addition of an attenuator, the amp can be used in a room for practice without disturbing the neighbors, and the same amp can hold its own in even the loudest of club settings.